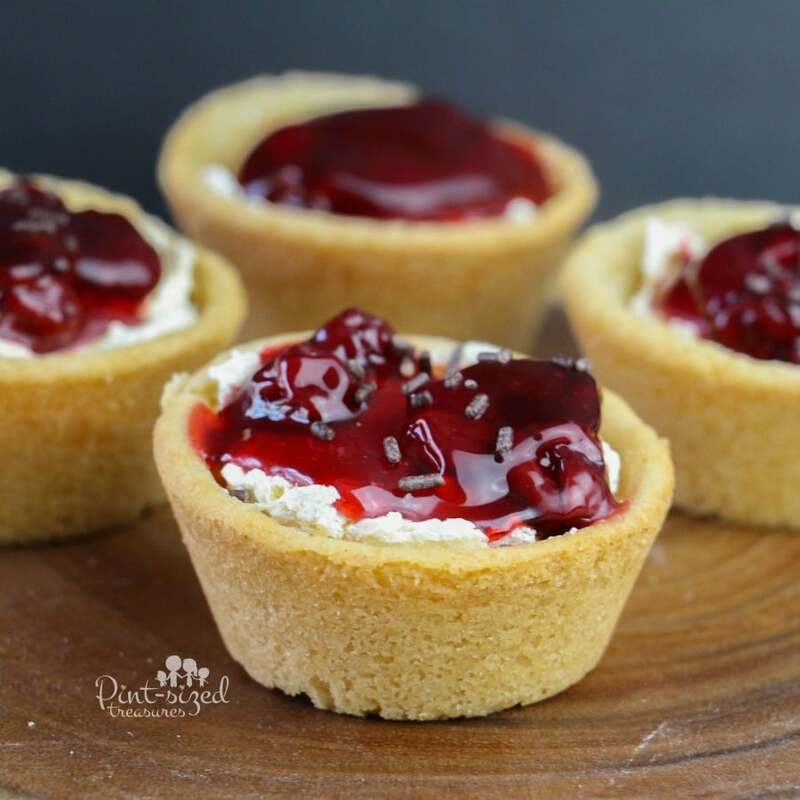 Cherry cheesecake sugar cookie cups are a go-to for a big party or get together. 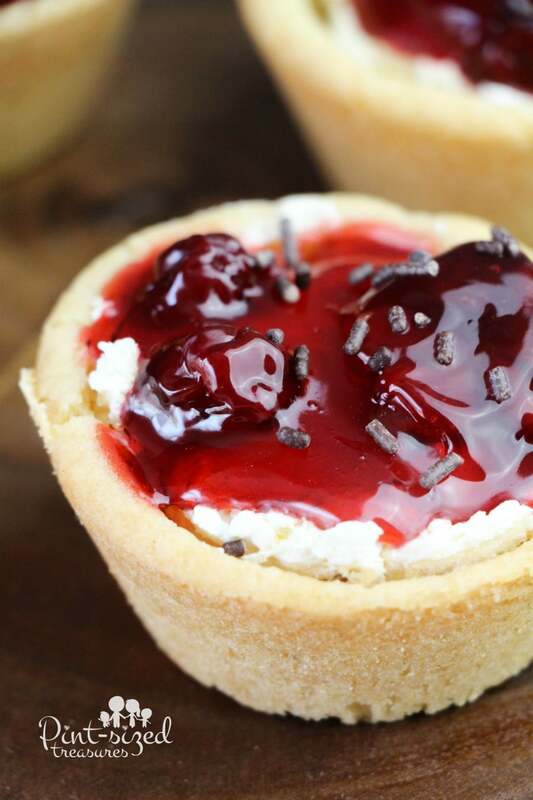 Gorgeous little sugar cookie cups are filled to the brim with creamy cheesecake and topped with sweet and tangy cherry topping. Don’t forget to add some dollops of homemade whipped cream and a few sprinkles of chocolate. Simple recipes keep this busy mom sane. Ok, they keep me happy, sane and smiling! 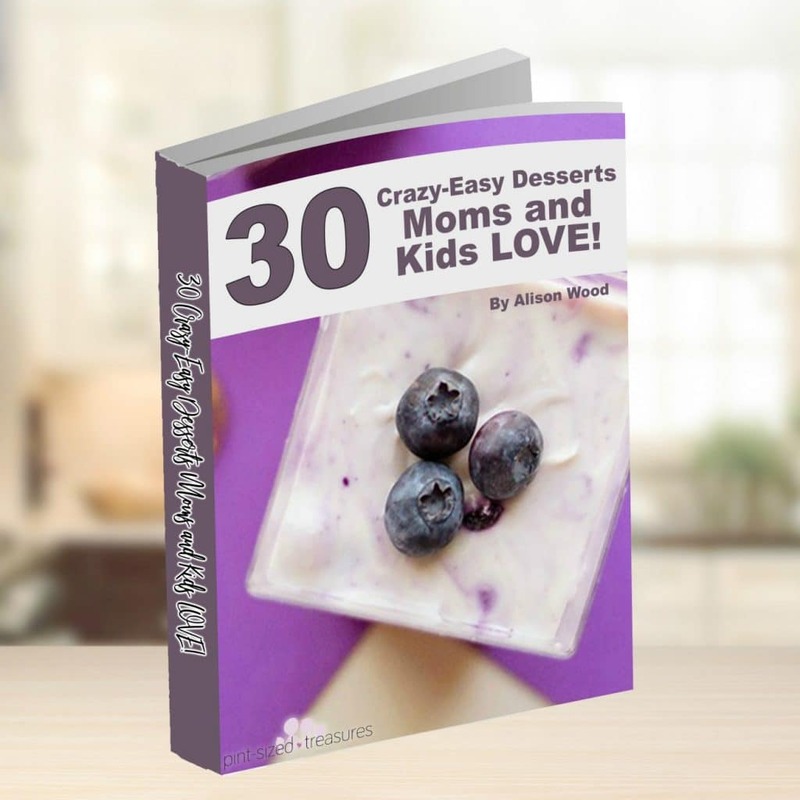 I even created a super simple dessert book you can grab now! It makes whipping up a dessert so easy you’ll want to try a new dessert recipe every single week! And since they’re crazy-easy, your kids can help too! Who doesn’t love a little sweet treat here and there? In our family no-bake cheesecakes are always an option. 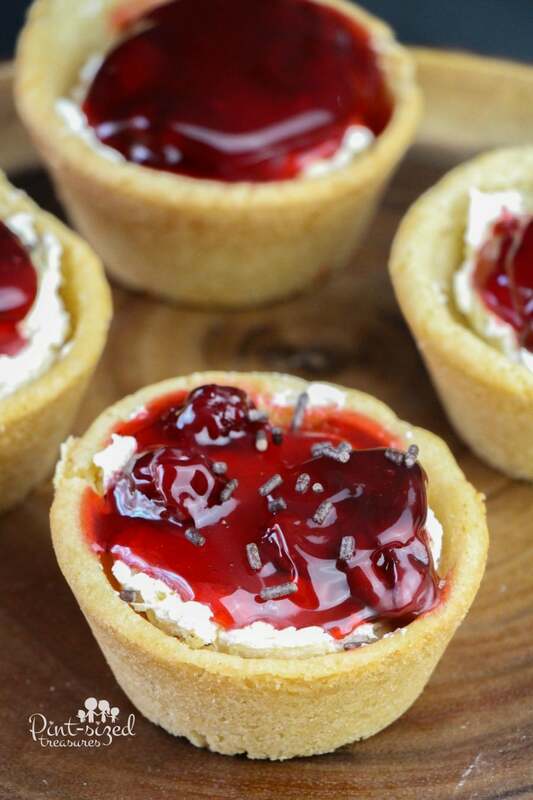 They’re smooth, creamy, create little mess and are definitely a low-fuss choice! You can check out another family fave — chocolate peanut butter cheesecake with a pretzel crust here. That one is soooooo good. Trust me on this one. Hmmm….maybe we should make it today! 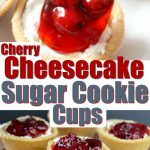 Cherry Cheesecake Cookie Cups are Super Simple! Yeah, we’re always changing things up. Sugar cookie crust today, pretzel crust tomorrow! But no matter how we change up our recipes, we always try to keep dessert simple! You won’t find Baked Alaska on our menu — ha! Oh, and we got really wild and crazy with some frozen oreo cheesecake bites. Want to try those? You can grab those here! Not a fan of cherry topping? You’re not alone. My husband is a no-frills kind of cheesecake guy. But the rest of us? We LOVE toppings! Top your cheesecake with chocolate chips, caramel or even a strawberry or apricot topping. Life is more blissful when you’re spontaneous, right?! This turtle recipe for cheesecake has a fun topping idea! And who doesn’t love turtle cheesecake?! If you want to be super lazy — ahem — I mean creative you can use store bought sugar cookie dough for the crust, but you didn’t hear that tip from me. I firmly believe that 90% of the time “from scratch” is better. Except pancakes. I love using a mix for those. If you want to use a store-bought crust, no judgment here, friend. All love — wink, wink! 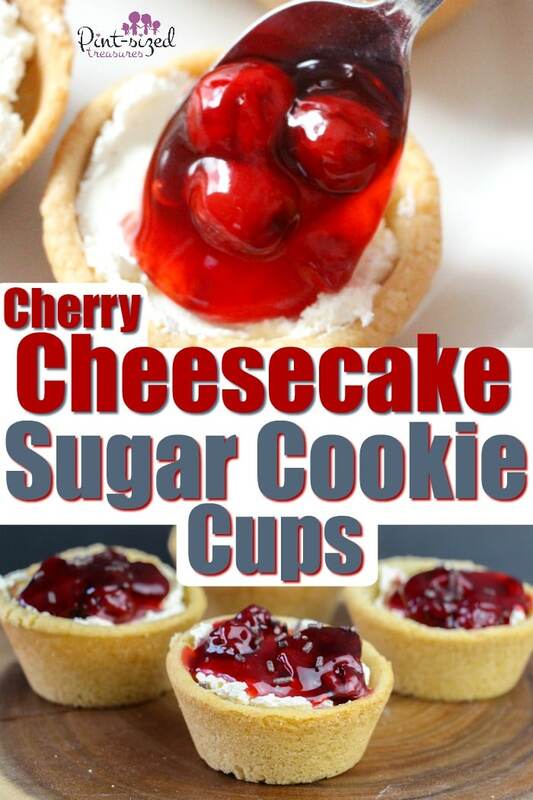 Easy-peasy, cherry cheesecake sugar cookie cups recipe is below! Just print, make and eat! But you better make extra! Everyone will want more than one serving. 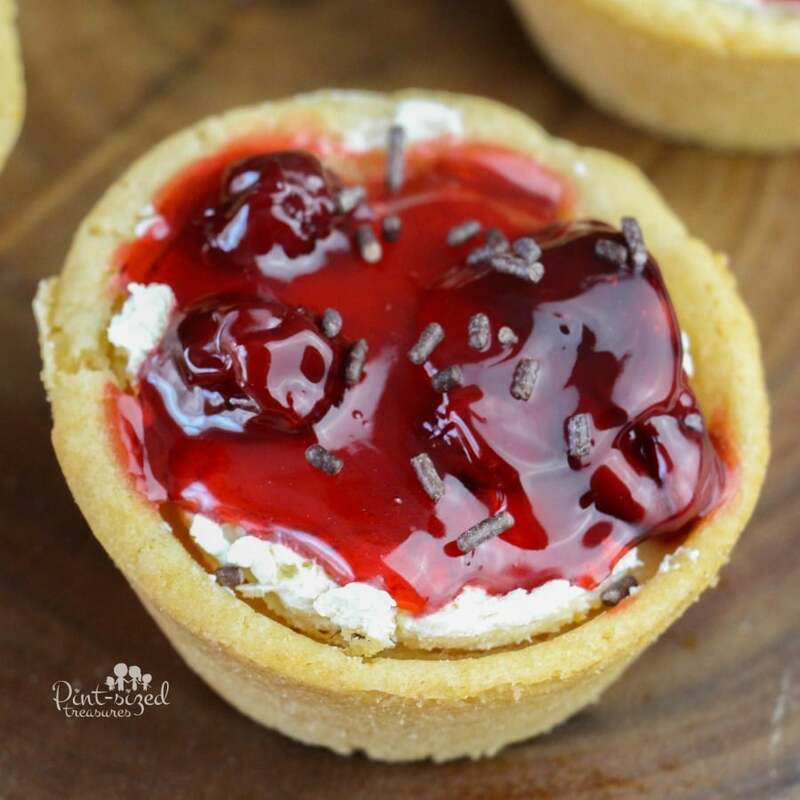 Easy, no bake cherry cheesecake sugar cookie cups are the perfect fun, light dessert for your next party or just a fun family night! You can change the toppings up and add a dash of fun! 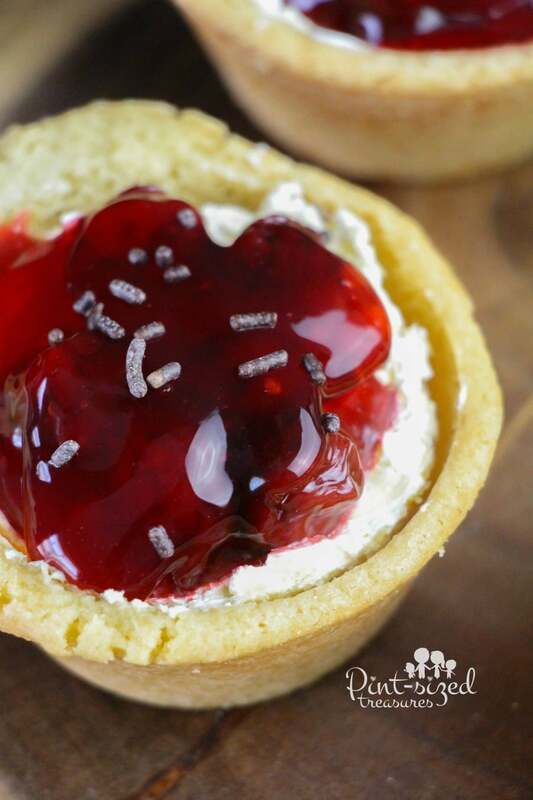 Enjoy a creative twist to classic cheesecake with these gorgeous cookie cups! Grease a muffin or tart tin and press 1-2 Tablespoons of chilled cookie dough into each indentation and press to shape into a cup shape (along the bottom and sides of the indentation). 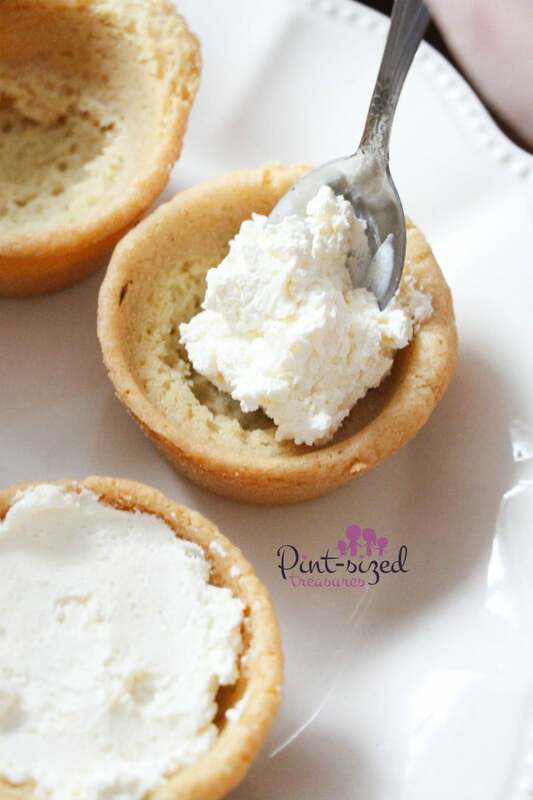 For the cheesecake filling, mix together the vanilla, cream cheese and whipped cream until fully combined. 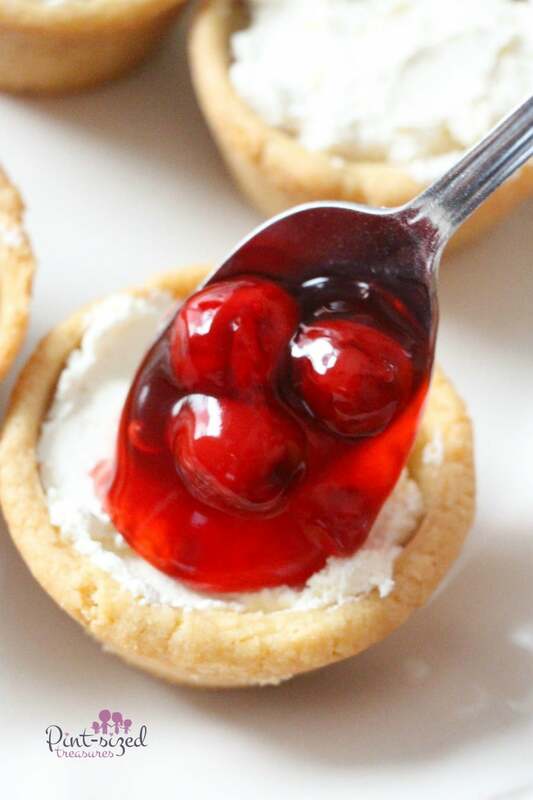 Spoon 1-2 Tablespoons of the cream cheese filling into the cookie cups and top with 1 Tablespoon of the cherry pie filling.